DUTY SERIES PROTOTYPE! 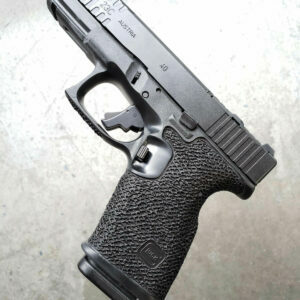 DISCOUNTED New old stock Duty Series prototype GLOCK 21 SF with Duty Series grip package (standard L1 reduction); frame index points; Vickers Tactical extended slide stop (OEM shown in the photo; it’ll come with a vickers) and magazine release; APEX/Ghost “Pro” trigger package. Plus Type 1 slide package and Trijicon HD night sights. This is an unfired demo gun we had on display at the shop, AND is also one of the very first packages we did while experimenting with the Duty Series frame and slide work prior to offering it as a package. The grip work was done by Ben while he was still working out the details/features of the Duty Series grip package, and has some of the enhanced features you’d get with the Hybrid option (premium Duty Series, $200 upgrade)…but the slide work has some minor machining blemishes that are purely cosmetic, so we are selling this unit at a nice discount. 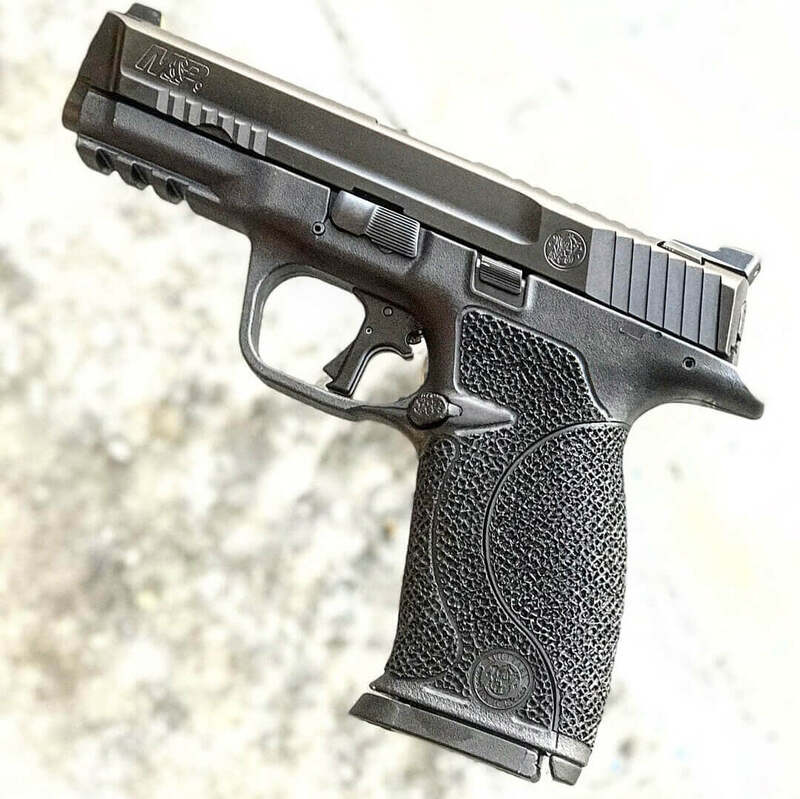 Smith & Wesson M&P 9mm, 4.25” barrel model, no thumb safeties. Full Duty Series frame and Type 1 slide package w/black nitride. Bottom of the trigger guard has been left untouched so you can add a memory groove (textured or polished / $65); You can also add frame index points ($50) and a APEX TACTICAL match barrel ($250). $1510 starting price. Free hat and free shipping to your FFL with this purchase. Note: shown with APEX Level 4 trigger package (add $255) and Trijicon HD sights (add $165 for HD, $175 for XR)…specify curved or flat trigger, and front sight color if adding these upgrades. Free hat and free shipping to your FFL with purchase. This gun came into our possession when Ben had to fly out of state a couple years ago, and at the last moment realized he’d left his airline approved lockable gun case at the shop, and didn’t have time to go back for it. So he flew without a pistol, and upon reaching his destination, he drove to the closest gun shop to get a sidearm. There in the display of used guns was this good condition, rare (limited numbers made, and no longer in production) Gen 3 GLOCK 23C! After returning from his trip, Ben put this one in his Signature Series queue and has been working on it little by little and finally finished it. 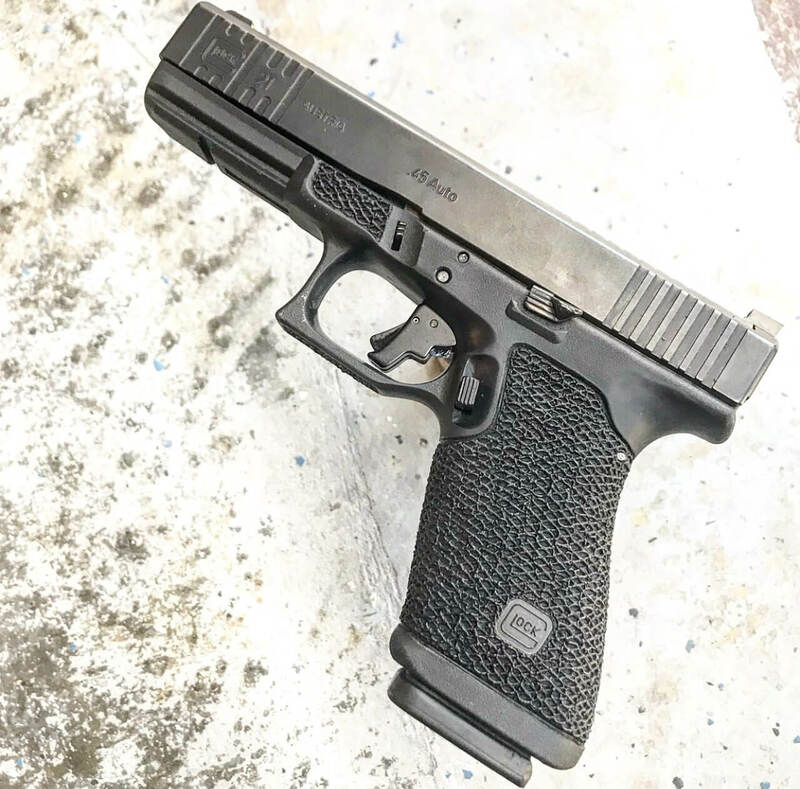 So here’s a relatively rare GLOCK in a rare configuration…meaning that it’s a Signature Series done and ready to ship without the usual long lead time to have Ben build you one. Rarely do we have a Signature Series gun done and ready to ship. This one is built as a clone of Ben’s personal carry gun, which also coincides with our most popular configuration of mods/features. 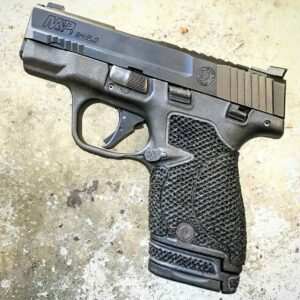 Smith & Wesson M&P Shield 9mm, with thumb safety. Full Duty Series frame and Type 1 slide package with black nitride. Trigger guard flat is textured. You can add frame index points ($50). Order your upgrades in the drop down menu, and specify front sight color in the notes when you check out. $1405 starting price. Note: shown with APEX Level 4 trigger package (add $255) and Trijicon HD sights (add $165 for HD, $175 for XR)…specify curved or flat trigger, and front sight color if adding these upgrades.